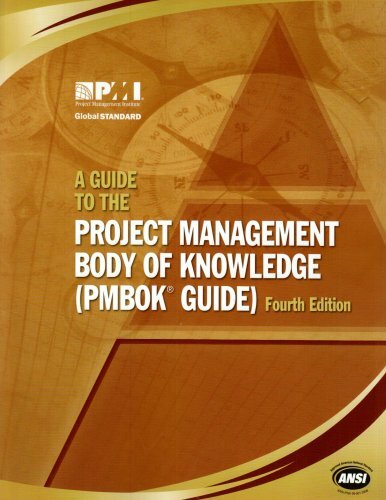 The PMBOK9(r) Guide – Fourth Edition continues the tradition ofexcellence in project management with a standard that is even easier tounderstand and implement, with improved consistency and greater clarification. Standard language has been incorporated throughout the document to aidreader understanding. Greater attention has been placed on how Knowledge Areas integrate in thecontext of Initiating, Planning, Executing, Monitoring & Controlling, andClosing process groups. Two new processes are featured: Identify Stakeholders and CollectRequirements. Book appeared fine at first, till I got to chapter 6, I only have 5 pages of chapter 6 and no chapter 7 at all. Instead I have two chapter 4's and two chapter 5's. I have now read this book two times over and every time I do I learn something new. I must say it's not the most exciting book I've ever read but it's effective in getting it's message across. I used this book in combination with CAPM Exam Prep: Rita Mulcahy's Course in a Book for Passing the CAPM Exam and I passed with flying colours. I was actually surprised how easy it was. I would recommend both books to anyone looking to pass the CAPM exam and even to pass the PMP exam. For anyone interested in furthering your Project Management knowledge, this book has it all.It will, however, require some commitment on your part.The baseline information is in the book, the rest is up to you. Knowledge management is the fast-track route to leveraging the intellectual capital in your organisation. It covers the key areas of knowledge management, from identifying knowledge in an organisation to promoting and facilitating knowledge sharing and innovation. It takes examples and lessons from some of the world's most successful business, including Shell Oil, British Aerospace, Dow Chemical and the World Bank, and ideas from the smartest thinkers, including Peter drucker, Michael Polanyi, and Ikujiro Nonaka. It includes a glossary of key concepts and a comprehensive resources guide. I bought this book as I wanted to improve my understanding of knowledge management (KM) and build on some concepts already known to me.Overall, this book did not disappoint.It gave me a good overview, highlighted KM's importance, re-confirmed that KM is not do once and forget, and it reminded me of differences between KM concepts such as explicit & tacit KM. Despite the books length, it fits a lot in, is simple and easy to understand and includes a few case studies highlighting KM in the 'real world'.Additionally, a fairly comprehensive reference list of KM terms is included, which I thought was a great addition. The only downside I found was I was left wanting.I felt the author could've explored some concepts in greater depth, and delve into the nitty gritty.For example, the case studies were interesting, but I found it hard to separate what was KM, what was just good management and what was organisational leadership.It is here I felt the author could've explored this, hence my 4/5. 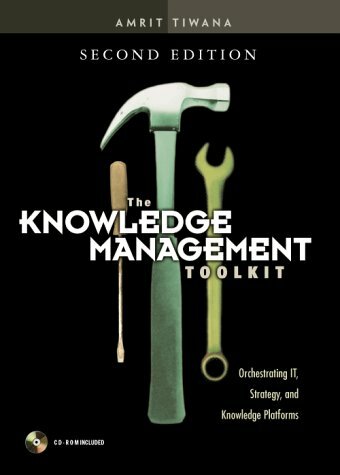 So in conclusion, if you are after an introduction to KM then this book is a good starting point.If you are wanting to build on your knowledge, learn more about how to apply it, the differences between management, KM and the like, then there may well be better books. Knowledge Management in a Knut Shell! 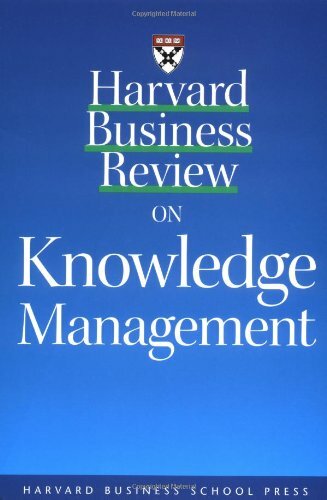 In another review for Carl Frappaolo's "Knowledge Management" I read something along the lines of: it's short, it's sweet, and it's useful. I couldn't agree more! 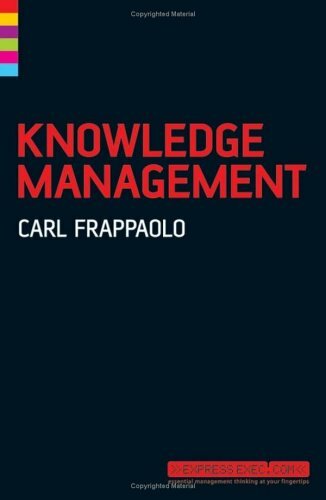 For those new to the worlds of knowledge management Frappaolo's succinct introduction to the field really is an essential first step, whether you are interested in pursuing studies or work in knowledge management (KM) or if you are getting up to speed on this topic. 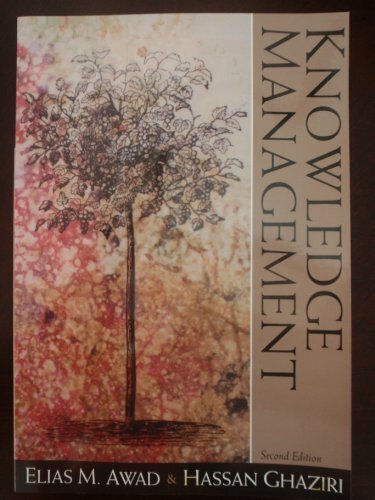 Deceptively thin, "Knowledge Management" is packed with the critical concepts, helpful information, and useful references for novices to experts in a variety of fields ranging from information technology, education and training, or organizational management, and all this in under 142 pages! Charting a logical progression from a perfunctory "Introduction to Knowledge Management" to "What is Knowledge Management," Frappaolo clearly maps out the terrain of what knowledge management is, how it is understood in a variety of contexts, and most importantly, he provides short cases studies integrating the intellectual underpinnings of knowledge management with the realities of the business world. He ends the book with three useful steps for readers looking to dive deeper in to knowledge management: "Key Concepts and Thinkers in Knowledge Management" provides a useful (although ever-changing) glossary of terms, and a micro-bibliography of eleven key figures in the evolution of knowledge management; a chapter dedicated to expanding the print and digital references; and finally, "Ten Steps to Making Knowledge Management Work," a truly elegant and simple plan for everyone to wrap their arms around making knowledge management an actionable concept and practice. Aside from the brevity of the book, the structure of the book deserves comment. 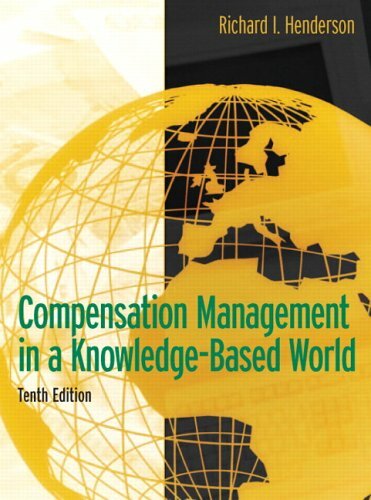 In a semi-academic (or B-School) format, each chapter offers a short introduction, a list of main points, the discussion of those points, and a summary or "Key Learning Points" tied back to the chapter's main points and highlights of the discussion topics, and intermittently the case study reviews of examples in sections titled "Best Practices in KM." Chapter 7, "Knowledge Management in Practice - Success Stories" provides more detailed case studies of examples woven throughout the book. I would have liked more detailed references for further reading, and of course the bibliographies could be more robust; but that is not the purpose of this book. Using the references cited and the micro-bibliographies in the references section, readers will easily round out their interests in knowledge management from the technological end to the managerial end. Blending academic, intellectual, and working knowledge together under the rubric of knowledge management, Frappaolo brilliantly demonstrates the potential successes of KM in this book through this old-fashioned "portal" to capture, illuminate, share, and evolve - in this case, it just happens to be about knowledge management; but the applications are limitless. I must admit to being a little suprised when I first received this book - it is "petite"! Was I going to get my money's worth I wondered? The answer is definitely yes - particularly if you are beginning in your knowledge management reading. In simple terms and in simple structure the author provides the reader with an understanding of KM history, the current state of KM, KM systems and processes and does not neglect the hard work of forging and shaping the necessary culture to support any such KM initiative. No less, no more. A great little beginning book and one I am sure I will return to for a quick update on any number of concepts. This book was an excellent resource to me.It got me well grounded in the principlesand practices of knowledge management.It is well written, concise and thorough.i wish I had found it earlier, before I read alot of other less valuable treatises on knowledge management.Its a keeper. This book is an excellent primer for those who don't know anything about Knowledge Management and those who need a reference on the subject. It is insightful, well written and a very quick read. It is one of those little books of gold you trip over every once in a while. It is also compact and well suited for business travel. 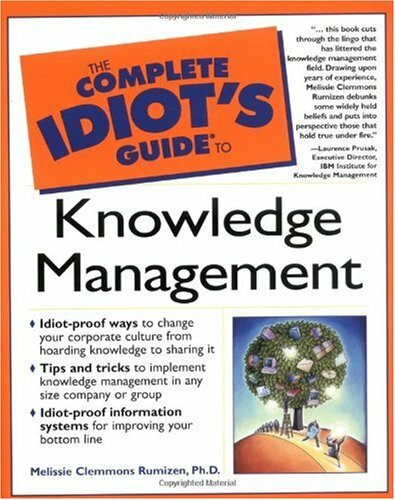 Ok but we found the complete idiot's guide on Knowledge Management to be a bit more useful for our needs. Used as a textbook for a leadership course. It is o.k., have read more interesting pieces of KM. Recommend if you need scholarly material. This is another great book in the HBR paperback series. There are several very helpful article/chapters in this book; each one taken alone is worth more than the cost of the book. The article by Argyris, "Teaching Smart People to Learn," is quite insightful. Argyris explains why smart, highly trained professionals find it difficult to learn from their mistakes and failures. In David Garvin's article/chapter, he talks about what real people in real organizations are doing to build learning organizations. John Seely Brown discusses the importance of new innovations found in "how work is done" in his chapter. Add to these helpful chapters, the work of Drucker, Nonaka, and Kleiner, and this is a must-have for practitioners. Author of "Strategic Organizational Learning"
I read this book when it was first published in 1998 and recently re-read it, curious to see how well it has held up since then. It has done so to a remarkable extent. Again, I am reminded of Derek Bok's observation "If you think education is expensive, try ignorance." This is one in a series of several dozen volumes which comprise the "Harvard Business Review Paperback Series." Each offers direct, convenient, and inexpensive access to the best thinking on the given subject in articles originally published by the Harvard Business Review. I strongly recommend all of the volumes in the series. The individual titles are listed at this Web site: www.hbsp.harvard.edu. The authors of various articles are among the world's most highly regarded experts on the given subject. All of the volumes have been carefully edited. An Executive Summary introduces each selection. Supplementary commentaries are also provided in most of the volumes, as is an "About the Contributors" section which usually includes suggestions of other sources which some readers may wish to explore. In this volume, we are provided with a variety of perspectives on knowledge management: Peter F. Drucker on "The Coming of the New Organization," Ikujiro Nonaka on "The Knowledge-Creating Company," David A. Garvin on "Building a Learning Organization," Chris Argyris on "Teaching Smart People How to Learn," Dorothy Leonard and Susaan Straus on "Putting Your Company's Whole Brain to work," Art Kleiner and George Roth on "How to Make Experience Your Company's Best Teacher," John Seely Brown on "Research That Reinvents the Corporation," and James Brien Quinn, Philip Anderson, and Sydney Finkelstein on "Managing Professional Intellect: Making the Most of the Best." Listing the article titles correctly indicate the nature and scope of the specific subjects offered. Quite true, some of the material is dated and inevitably so, given the elapsed time since the articles were published in the Harvard Business Review. However, in my opinion, the principles advocated and the core strategies recommended remain relevant to the contemporary marketplace. For example, Drucker notes that "to remain competitive -- maybe even to survive -- businesses will have to convert themselves into organizations of knowledge specialists." Garvin presents an especially informative analysis of Xerox's six-step problem-solving process which addresses questions to be answered, expansion/divergence issues, contraction/convergence issues, and "next steps" after implementation. Leonard and Straus rigorously examine the Myers-Briggs Type Indicator process, including within their narrative a brilliant overview of the MBTI©. Indeed, readers are provided with rock-solid material throughout each article. For less than the cost of breakfast in an upscale Manhattan restaurant, each volume in this series provides an intellectual feast. It remains for each reader to determine, of course, which of the volumes will be most nutritious to her or his appetite.Those who share my high regard for this volume are urged to check out Carla O'Dell's If Only We Knew What We Know: The Transfer of Internal Knowledge and Best Practice, Peter Senge's The Fifth Discipline and The Dance of Change, Thomas H. Davenport and Laurence Prusak's What's the Big Idea? : Creating and Capitalizing on the Best New Management Thinking and also their Working Knowledge, Jeffrey Pfeffer and Robert I. Sutton's The Knowing-Doing Gap: How Smart Companies Turn Knowledge into Action, and Ikujiro Nonaka and Hirotaka Takeuchi's The Knowledge-Creating Company: How Japanese Companies Create the Dynamics of Innovation. Excelente libro que proporciona las bases suficientes sobre la administración del conocimiento, además de tener como respaldo el prestigio de una casa de estudios como es la Universidad de Harvard. This is my review of "The Complete Idiot's Guide to Knowledge Management" book, copyright 2002, authored by Dr. Melissie Clemmons Rumizen (ISBN: 0-02-864177-9). I am usually highly skeptical of any book having "idiot's guide" in the title, especially meant for technical fields, but after reading another members post about this book I decided to order it and give it a read. c. What's a chief knowledge officer? a. Where did we go wrong? This book, as for all idiot guides, is primarily oriented toward beginning to intermediate practitioners, although it plain english approach makes it a good reference addition to even expert skill level personnel. It does a pretty good job of covering the basics every KM professional needs to know, especially those new to the field. 1. Good general reference for the new CKO/KMO. 2. How to deal with organizational culture and marketing. 3. How to measure success or failure of your KM efforts. 4. Helps you to better understand your proper relationship with the CIO/IT. 5. Helps you to put together your initial organizational strategy. 6. Excellent coverage of communities of practice. 7. Discusses change management an often neglected topic in KM. 8. Addresses the danger of focusing primarily on technology to solve KM problems within an organization. 1. Needs a chapter on knowledge transfer. This essential is glossed over in its present form. 2. A little too general. Often weak on actual specific techniques and methods you can use. 3. Needs to be updated. The KM profession and technologies has continued to evolve since the book was first published in 2002. 4. Doesn't cover Wiki or other online collaborative technologies beyond communities of practice. Summary: Despite my initial skepticism I found myself liking this book and recommend it to my fellow KM professionals as one of your primary desk references. Background on myself: I am a military KM professional who has worked this field from 2005 to present and has certifications from KMI, KMPro and the U.S. Army. I created and facilitated the DOD KMNet Community of Practice from 2007-2009 (a community of practice for all military KM professionals). I'm a newbee to KM.I was looking for a clear and concise explanation that would enable me to take some baby steps without being overwhelming.This is it. 1. There is a need to define the target audience for this book. 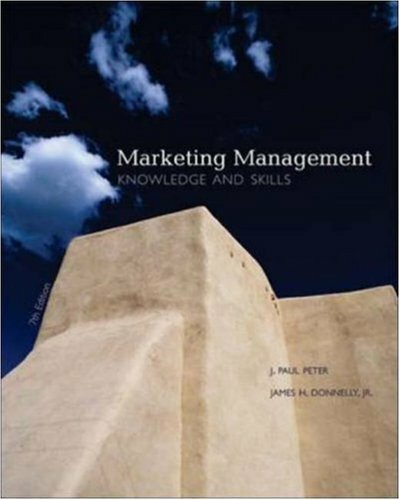 The book's title would suggest that it is directed at the complete novice in the field of knowledge management. However, the book goes way beyond the basics of KM. In some instances, you are made to feel as if you are a CKO in the making, which obviously is not what the title conveys. 2. The author goes a bit too personal in recounting certain anecdotes or events which are used to illustrate the points in the book. Overall, I would say very informative. If you need a quick intro in KM, this is a pretty good book to start with. Very useful indeed. It covers all aspects of KM and gives smart tips for the how-to-do part. Also it suggests very useful web links. I love the down-to-earth, simple, practical approach. No idiot may write this book. As knowledge management becomes embedded within organizations it becomes more important for students to understand its principles and applications. 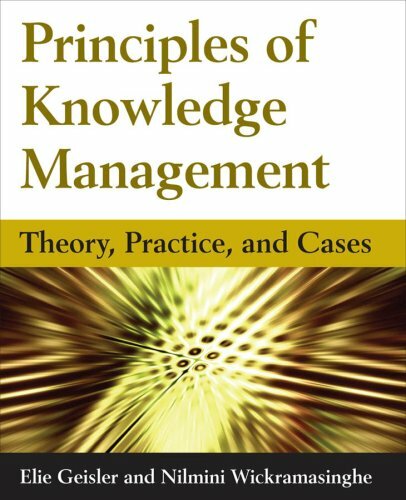 In this textbook, Dr. Kimiz Dalkir provides a comprehensive overview of the field on knowledge management with an emphasis on translating theory into practice. Working from a multidisciplinary perspective, Dr. Dalkir weaves key concepts, tools, and techniques from sociology, cognitive science, content management, knowledge engineering, cybernetics, organizational behaviour, change management, and information science into a three-level approach to understand Knowledge Management from the individual, community, and organization levels. Using everyday language and clear illustrations, Dr. Dalkir integrates theory and practice in a highly accessible manner to provide students with a comprehensive and practical knowledge management skill set. Kimiz Dalkir has penned a densely rich tome, with every page and chapter brimming with charts, models, definitions, and applications relating to knowledge management.In most respects, this is a text book - mostly at home as a companion to an introductory (or even survey course) on KM; yet the references are useful enough to be practical in developing executive presentations and planning for KM implementations.Equally useful as a reference, it belongs on the shelf of every Learning Organization. 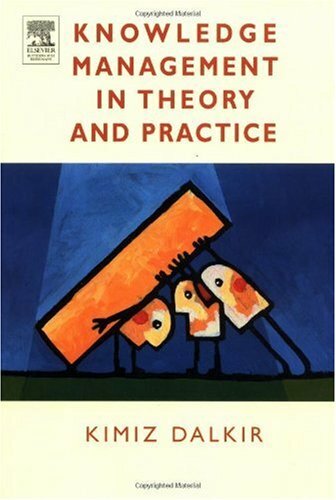 This is one of several KW texts that apply practice to the theory. This is not as dated as it seems, and I keep referring back to it. A great new way of thinking! For the people who is involved with KM, you may have read a lot of information about it. KM is a complex and theoretical topic, with a lot of theory. This book takes yoy step by step, since conceps to implementation, helping you with a KM CD that has usefull tools for the KM practice. This is a book that makes a good balance between theory and practice. It presents a complete step by step guide to implement KM in your organization. I recommend it for people who are in charge of a Knowledge Management Project or defining a KM strategy for their organizations. Is not an only "theory" book like most text or articles on knowledge management. Illustrative book with templates, checklists that can help you organize your KM project. Most texts on knowledge management are strictly theory. This is one of the few that I have seen that has taken a "hands on" approach to KM. Certainly a lofty goal, and the author does a good job trying to reach it, but still falls somewhat short. The diagrams, checklists, and templates are thought-provoking, and will help you design YOUR KM program. Full lifecycle, thorough, and plenty of case studies. Overall, I'm quite pleased with its content. One will almost immediately notice the research and writing style--the author is obviously from the academic world. 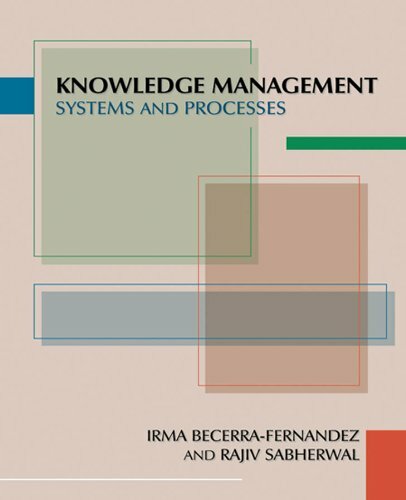 This book is a practical guide for anyone charged with implementing a knowledge management (KM) system. At first glance, some practitioners may think the book is too basic. They may assume that they already know everything, or that all they have to do is replicate what other firms are doing. Other readers may feel so overwhelmed with the task of knowledge management that they will welcome any advice. 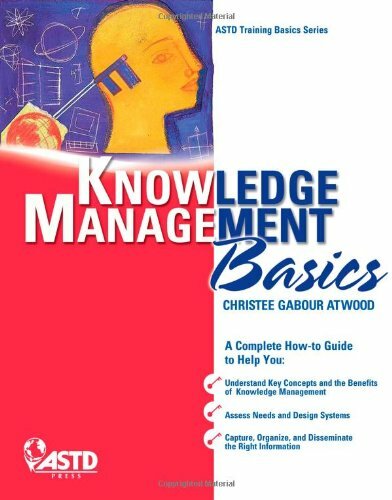 Business trainer Christee Gabour Atwood's book can help knowledge management professionals on every level. She stresses the need for a customized system, built largely on the input of the employees who hold most of an organization's knowledge. This quick, easy read offers insightful suggestions and lists of tips about every step of implementing a KM system. Even if this book serves you only as a review, getAbstract finds that its information is comprehensive. In fact, you could easily convert it to checklists to guide you through the KM process. Book arrived on-time and in good condition. The book arrived at the expected time and it is as the seller described, in good shape with the original CD included. The book is fine, written in but that doesn't bother me as much as the CD was not included in the book.The previous person kept the CD which is making me go out and find the software required for the book. My employer has mandated that the leads in the company take a project management 6 month series of classes .This book had proven invaluable!If you can master the processes described in the PMBOK Guide, you can manage any project!Excellent! This is the primary book they used in my 1 week Project Management course. Dry, boring, and is basically a text book, but you need the information to pass the test. Thanks very much for the prompt delivery of the book. 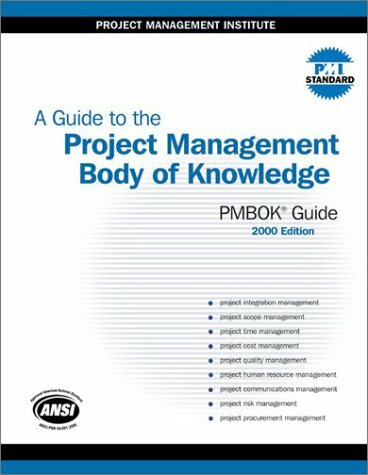 A Guide to the Project Management Body of Knowledge(PMBOK® Guide)– 2000 Edition is your basic reference and theworld’s de facto standard for the project management profession. Itwas designated an American National Standard (ANSI/PMI 99-001-2000) bythe American National Standards Institute in March 2001. The Project Management Body of Knowledge (PMBOK®) is an inclusive termthat describes the sum of knowledge within the profession of projectmanagement. The PMBOK® Guide identifies and describes the subset ofprinciples and practices within the PMBOK® that are generally acceptedand applicable to most projects most of the time. The guide alsoprovides a common lexicon for talking about projectmanagement. Project management is a relatively young profession, andwhile there is substantial commonality around what is done, there isrelatively little commonality in the terms used. An extensive glossaryfurther aids in standardizing definitions of the most importantconcepts, terms, and phrases. • Aligned newly added processes, tools, and techniques with the five project processes and nine knowledge areas. For example, reserve time, variance analysis, and activity attributes were added to Chapter 6 (Project Time Management); estimating publications and earned value were added to Chapter 7 (Project Cost Management); and project reports, project presentations, and project closure were added to Chapter 10 (Project Communications Management). • Added a section in Chapter 2 to acknowledge the role of the Project Office; expanded the treatment of earned value management in Chapter 4 and Chapter 10; and added a brief discussion of the Theory of Constraints in Chapter 6. • Expanded Chapter 11 (Project Risk Management) to include six processes instead of the previous four: Risk Management Planning, Risk Identification, Risk Assessment, RiskQuantification, Risk Response Planning, and Risk Monitoring and Control. • Strengthened the linkage between organizational strategy and project management throughout. The PMBOK® Guide is one of those indispensable tools that you will want at your fingertips, both at work and in your home office. Selected as a suggested resource for CAPM®, CAQ® Automotive Product Development, CAQ Capital Projects, CAQ Information Technology Systems, CAQ Information Technology Networking, and CAQ Project Management Office exam preparation. I feel that it is important to mention that I have had little project management experience.I purchased the CD-ROM version of this book in preparation to take the CAPM exam given by PMI.The 2000 version of the PMBOK guide is obsolete as of September 2005.The PMI exams are now based on the Third edition of this guide. I found this book to be as exciting to read as the Yellow Pages, though I will admit that if I were an experienced project manager, I would find the book much better reading.The book has a simple layout, with three sections. The first section is on project management framework.This section is comprised of three chapters that discuss appropriate definitions, parts of a project, and processes used in project management. 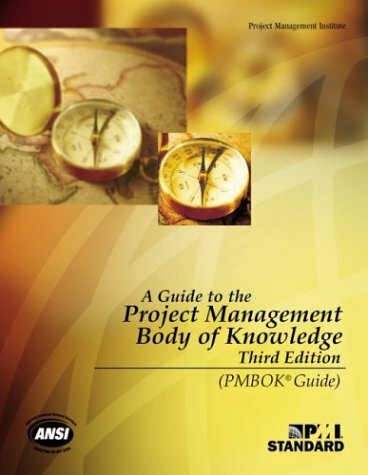 The second section is the main portion of the book.Section 2 covers the project management knowledge area.Comprised of 9 chapters, each chapter covers a knowledge area.These knowledge areas are Project Integration Management, Project Scope Management, Project Time Management, Project Cost Management, Project Quality Management, Project Human Resources Management, Project Risk Management, and Project Procurement Management. The final section is a series of appendices that I did not find applicable to the passing the PMP or CAPM exam. Unfortunately, everything that is on the certification exams is not in this book.While the PMBOK creates an excellent framework for the proper techniques to use in project management, this book alone is not sufficient to pass the certification exams.I would highly recommend the "PMP Exam Prep by Rita Mulcahy" if you are going to take either of the certification exams. This book was an incredibly painful read.The information provided is in a very uninteresting list format similar to an outline used to write speeches and papers.If you are new to the world of project management and are looking for a guide, while this book is necessary to manage projects effectively, there are probably better books to get started with.I would recommend this book to experienced project managers or people going for the PMP or CAPM certifications. The "official" body of knowledge from PMI is shrinking, rather than growing.Older editions of the PMBOK include more substance and may be useful in preparing for your PMP certification exam.However, don't rely on the PMBok alone.The exam touches many topics not included in this, or older versions. There is not much to say about the PMBOK's content. It was the de facto standard for project management from 2000 to 2004. The content is simply excellent. If you intend to take the PMP exam before September 2005, you simply must buy it. If you intend to take the test after that date, though, you should buy the 2004 version. This is book not for amateurs. If you have no experience whatsoever or knowledge of project management, this will not be an easy reading. This book is a good reference and should be used as a reference book.You need to know the content of this book to pass the PMP.However, don't use thie book at the only source of study.Get a copy of Andy Crowe's "The PMP Exam: How to Pass on Your First Try" and "The Ultimate PMP Study Aid" (from ebay). By the way, when your join the PMI memnbership, they will send a CDROM verson of the book free. This reference is good for a base of terminology for Project Management. Unfortunately, because the difference between an IT project and a Construction project is so great, the BOK can only address high-level concepts. The golden nugget is that what the BOK does address are time-tested standards that help all project managers. Why do you make a Charter? What goes in it? What do you get out of it? The BOK answers all these questions. By following the framework, your projects will have a fighting chance and not get caught up in a tangle of disorganization. 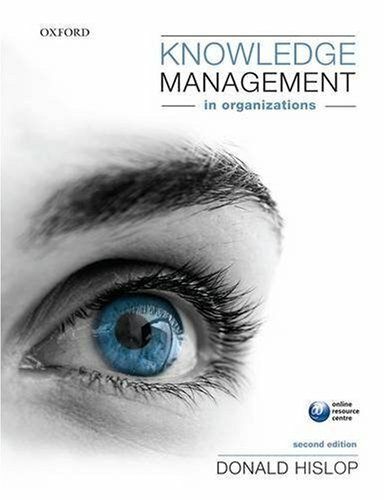 Building on the success of the first edition, the second edition of Knowledge Management in Organizations presents a critical introduction to the subject. Adopting a multidisciplinary perspective, encompassing issues of strategy, structure, systems and human resource management, the text introduces the reader to the concept of knowledge before examining how, and whether, knowledge can be managed within the organizations in which we work. Three brand new chapters have been included in the second edition, enhancing the book's coverage of leadership, defining knowledge management, and examining how organizations replace and "unlearn" knowledge. New case examples and longer end of chapter case studies have been added to this new edition, with other features including definition boxes, further reading and review questions being retained. 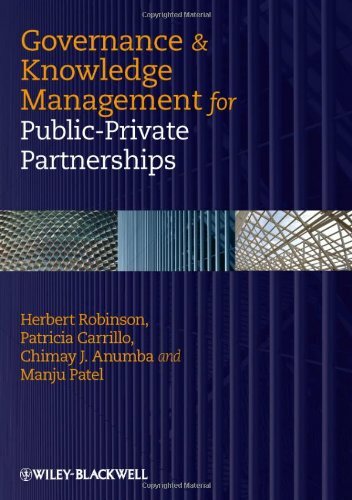 "Garvey and Williamson's book presents a significant and much needed advance of the literature on knowledge management. This text opens up the horizons to show the complex human and social dimensions of generating, transmitting and maintaining useful knowledge in organizations. Both erudite and practical, the authors address the topic from multiple theoretical and epistemological perspectives and thus pay tribute to its complex nature. At the same time, the book succeeds in showing the strateic importance of knowledge management in the context of human resource development and oranizational change. A much needed addition to existing literature and of great value to both academic and practitioner audiences."K. Peter Kuchinke, Professor of Human Resource Development, University of Illinois, USA "This book lives up to its title. It takes the fashionable topic of knowledge management and explores in depth its broader implications, particularly those concerned with organisational and individual learning. "Michael Armstrong, Independent Management Consultant, author and Fellow of the CIPD and Institute of Management Consultants This unique, engaging and timely book explores the ways in which learning and knowledge processes link to the success of an organisation. IT encourages managers to think critically and offers useful frameworks for identifying and releasing tacit knowledge. Looking at knowledge management in a holistic way, Mastering Organizational Knowledge Flow: How to Make Knowledge Sharing Work puts the proper emphasis on non-technical issues. As knowledge is deeply connected to humans, the author moves away from the often overused and therefore burned-out term "knowledge management" to the better-suited term "knowledge flow management." Mr. Leistner hits the knowledge-management-nail on the head! 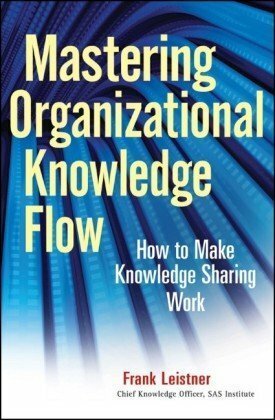 In his new book "Mastering Organizational Knowledge Flow," Frank Leistner provides a fresh, comprehensive, and straight-forward approach for understanding, and correcting, the major challenges with knowledge management. He reminds us that information without context or meaning, is not 'knowledge'.Although he is the current Chief Knowledge Officer with the SAS Institute, the book is not full of SAS examples.In fact, it reads as a 'how-to', and a 'what-not-to-do', guide for any organization.As the author points out, the human factor, and more specifically trust, is the essential cornerstone for turning information management into knowledge flow.Well written and accessible for any background, this book should be required reading for anyone in the IT or KM field. My interest in this came about when I first met Frank at the SAS Global Forum in April 2010. I purchased the book shortly after, and read it on the plane flight back to India. As I was reading it, two things struck me: First, Frank has a very clear way of explaining how knowledge flows through an organization. He cites the development of an internal application (ToolPool) used at SAS to illustrate the key points. Second, the flow of knowledge that Frank refers to within an organization is equally applicable outside the organization, and in particular in understanding how to envision and implement social applications that connect customers and businesses, an very timely concept. This makes Frank's book required reading for team leaders and product managers considering the implementation of collaborative social applications in business. I highly recommend this book. Knowledge Management was a technology concept that once understood held great potential for any organization that which to capture and retain its experienced based information that frequently was only documented in the minds of those who worked for the organization.However, explaining to non-IT senior executives the benefits of knowledge management, and defining a way to capture that knowledge let alone manage it has always been a daunting challenge. 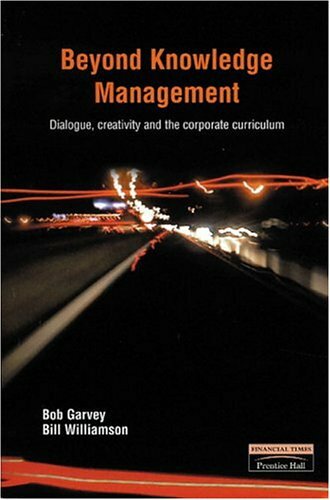 The emphasis on knowledge flow rather than management is the distinguishing factor that characterizes this book. It is aquick read, informative and thought provoking.As in all such text books on these subjects there are valleys, where you wonder if the only reason for the chapter text was to ensure the publisher got what they wanted.But these valleys of interesting yet unvaluable content are few and far between. I usually do not buy used books but because of the price, I went aheadwith this purchase. The description was "used, like new". The book was exactly like the description explained, very good condition, not a lot of writing, like new. I am definetely buying more from this seller. This has been my favorite textbook in my college career. It has rather short chapters, or the layout is good, it does not seem the chapters go on forever. It gets straight to the point and is very informative and the information interesting. Even though it is a textbook I wanted to keep reading it. For a first-time textbook buyer from Amazon I was hesitant about purchasing books this way. But it was easy, and quick. The book was in excellent condition, like brand new, and I received it very promptly. I will definitely recommend purchasing textbooks this way to family, friends, and classmates. A good text book, but a text book all the same. This book is well written, informative & exceptionally boring. Richard Henderson, a compensation master, is superfluously long in the tooth. This book will get you an A & put you to sleep. The facilitation of knowledge work or what is increasingly known as "Case Management" represents the next imperative in office automation. The desire to fully support knowledge workers within the workplace is not new. What's new is that recent advances in Information Technology now make the management of unpredictablecircumstances a practical reality. thus there is a new groundswell of activity around unstructured processes. I think a sea change is coming in the process world. The sea of change Moore refers to is about technology that is able to support knowledge workers. The work of a knowledge worker is by its nature unpredictable and can not be handled by more formalized process definition techniques. I never understood the difference between "case management" and BPM until I read "Mastering the Unpredictable". Civerex built a `case management' in 1992 that evolved to where it has a strong focus on guiding the processing of patients according to "best practice" protocols. We took this direction this because our company received a grant from a hospital association to build healthcare software where the entire focus is on instances (i.e. patients), and where no two instances are handled in exactly the same way. We had `cases' from the start and we called these Electronic Medical Records (EMRs). We never had issues with unstructured work - our users could process patients using protocols, process patients not using protocols, or both. Basically, they have always done what they like, when they like, how they like. I found by reading "Mastering the Unpredictable" that part of what we have been doing for the past 15 years is called ACM. We realized something was different about our BPM system. We found it difficult to engage many consultants in conversations about our software - they would typically look at us as if we were from another planet. So, we renamed our approach at one stage to BPMx. And then, about a month ago, to ACM/BPM. I don't understand or agree with everything in the book but our ability to communicate with management consultants has improved dramatically. I tell anyone who will listen that "Mastering the Unpredictable" is a must-read. Karl Walter Keirstead, P. Eng. Business Process is not an assembly line! As a coauthor of 'Mastering The Unpredictable' (MtU), I am very glad that finally the recognition emerges that not all business processes can be modelled and 'hardcoded' into rigid flowcharts. I have been promoting this for over ten years. James March (1991) said that each business has to perform both exploitative (use existing knowledge) and explorative (create new knowledge) work to stay in business. Orthodox BPM can only support existing knowledge and tries to automate it to the point that virtually anyone could execute it. That is most probably only possible for at most 20-30% of all processes. Approximately 40-50% of all processes are executed by so called knowledge workers who enjoy very limited IT support today. Most of it happens through email, office products and some collaboration tools. These workers need to switch between multiple systems (i.e. CRM and ECM) and there is no complete customer focused record of their work. In this book there are many different approaches described how knowledge workers can be supported. That is an important first step and therefore MtU is a perfect introduction into this subject because of the collaboration of so many industry experts. It thus avoids the oversimplified 'How-To' step by step lists that are mostly unrealistic. I saw it as my part to add to this book which elements of IT are necessary to make ACM or Adaptive Case Management feasible. The other authors describe many examples of knowledge work, how the collaboration is different from typical case management and how data and process interconnect. A common question is how the term ADAPTIVE pertains to in this approach and how it differentiates from case management. 'Adaptive' is more than a new buzzword, because I started to discuss the concept five years ago in difference to 'agile' in process management, because it describes the ability of an entity to change from within, without external change agents. 'Agile BPM' requires long analysis phases by large numbers of experts who then implement complex processes by means of flowcharts. ADAPTIVE moves the process analysis and creation phase into the execution (sometimes referred to as enactement in BPM) and empowers business users to assemble processes focused on the goals they want to achieve. Only when all elements of ACM are user definable, it becomes realistic that this empowerment can actually happen as otherwise additional IT work is necessary to complete the process. 'Mastering The Unpredictable' is a unique collaboration of industry experts who usually compete. Therefore it represents a perfect opportunity to learn from so many within one book. Keith Swenson's main contribution was to bring twelve experts together and push us to bring our knowledge to you. This is right now not only the only book on this subject but it will be the reference overview for many years to come. For several years now, business process theorists have been concerned with describing the difference between processes that are more-or-less procedural in nature and slow to change and those processes that either change frequently, are very complex and difficult to describe, or both. A good example of a procedural process that is slow to change is a production line situation where each assembly worker's job is precisely defined. A good example of a complex, dynamic process is a process that generates proposals for major engineering undertakings.The process begins when the engineering firm receives a request for a bid.Someone at the firm analyzes the request to determine if the firm is even interested in bidding.Assuming the request is something the firm is interested in, a team is assembled to analyze the problem, design a solution and generate a bid.In the course of the project members of the team may send emails to colleagues around the world to find out about problems with similar jobs, to learn more about the needs of the company making the request, and to gather information about technologies that might be used.Similarly, there may be many meetings in which issues are argued out, solutions are discussed or the language of the final proposal is discussed.The proposal, when it is finally prepared and submitted may have characteristics in common with other proposals the engineering firm has submitted in the past, but it is also a unique response to a unique proposal.In other words, the response to the request was treated as a unique case.The approach and activities undertaken were adapted to the unique needs of the client and the skills of the team assembled to generate the proposal.And the entire effort was managed, at least in part, according to unique criteria associated with the specific request. Historically, consulting firms have always used an approach more-or-less like the one just described.As other organizations offer more options and tailor to customer demands, they have also begun to introduce more flexibility into their processes.Similarly, as organizations rely more on knowledge workers who add value to services by refining them as they interact with customers, process analysts have been challenged to figure out how best to describe and specify improvements for complex, dynamic, knowledge-based processes.A variety of names have been proposed to describe these processes.Case Management has its roots in hospitals and insurance companies where the term reflects the idea that each patient's case needs to be considered as a unique case and that each insurance claim, is, so some extent, a unique case that needs to be carefully examined to determine which rules apply. Theorists like Keith Harrison-Broninski have been discussing complex, dynamic processes for several years.The Object Management Group (OMG) began to discuss this type of process modeling problem in 2009 and has been using the term Case Management to describe the approach they are trying to define and standardize.I would prefer that they use something a little more descriptive, like "dynamic, complex processes," but can certainly use Case Management if that's what the community settles on. Adaptive Case Management (ACM) describes an approach for capturing and automating the work that knowledge workers do.In essence, the authors propose a systematic approach for the description and capture of processes undertaken by knowledge workers - processes I would suggest range from a few hundred to a thousand rules. 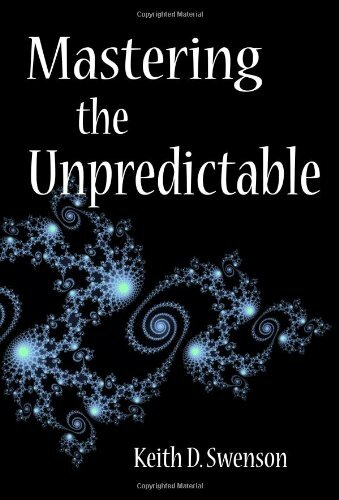 Mastering the Unpredictable is a book of readings and the contributors include many people who have been involved in the OMG effort. As with any book of this type, some chapters are better than others.Chapters 5, 6 and 7 form the heart of the book and should be read by anyone interested in the future of BPMS and process automation. The authors often contrast what they are recommending with BPM, which they say begins with and focuses on processes (procedural sequences)In essence, they are contrasting BPMS tools based on Enterprise Application Integration and older workflow approaches and their approach which depends on dynamic planning, "Tasks" ("templates") and rules. Let's begin with the idea of tasks or templates, as these terms are used by the authors.A "case" is something that you want to accomplish. As the authors are using these terms, a process is a sequence.Each subprocess gets done in a specific order.A "task" is one or more activities that need to be accomplished to complete a case, but its use or its order can't be determined until we know the specific case.Thus, instead of a flow plan, the knowledge worker about to undertake the specific case considers a list of tasks and decides which he or she will use for this specific case, and in what order the tasks will be attempted.In other words, one of the first tasks in the case involved planning the tasks and tentative sequence for the specific case. Note that his places a limitation on automation - ACM applications are designed to support knowledge workers, not replace them. For any given case, only a subset of the tasks may be employed. The structure of the tasks themselves are largely based on the use of rules.The rules used, however, are mostly derived from knowledge workers, however, and not from organization policies. Stepping back a bit, we are seeing an effort to reestablish some of the concepts used with expert systems development in the 80s.Instead of structuring the approach around a flow (procedural) we are going to structure the approach around knowledge concepts (data structures) and rules - a declarative approach.Our concern, in almost all the examples provided in the book, is not with accomplishing a task, but in reaching a decision or defining a solution. One might suggest that BPMS vendors began with procedural techniques, then begin to add rule-based techniques.Adaptive Case Management suggests how the rule-based techniques might take over and provide developers with tools that make it easier to model and automate knowledge structures and knowledge-based tasks. This is an important book.It does not provide the kinds of concrete examples one might like, with detailed discussions of how a specific set of cases might be processed, but hopefully that will come in a subsequent volume.What this book does is define the fundamentals that might be used to develop what I think of as rule-based or agile workflow systems. This is a significant step beyond the more or less independent business rule approaches that have been popular in the last decade and represents a return to knowledge-based techniques that predominated in the Eighties.It is a direct result of some very serious thought about how rule or knowledge-based techniques can be used to help model and automate complex, dynamic processes. The contrast several authors set up between BPMS and their ACM approach is dramatic, but probably not as significant as they think.Lots of good enterprise work can be done with high-level processes that will be completely compatible with the use of ACM techniques at more detailed levels.ACM is not an alternative, but a set of tools that can be used on one set of problems that process analysts face. I do not believe the techniques described in this book can be scaled to deal with really complex problems - for the same reason that expert systems failed - because the rule maintenance problems would be too expensive.I do believe, however, that the time is right to apply these techniques to extending BPMS tools for use with processes that include tasks that depend on knowledge.Moreover, as these applications illustrate, the tools only work if there are knowledge workers to plan each case and adjust the tasks and choose among the options offered by the ACM tools.In other words, we are always talking about a Decision Support tool here rather than a fully automated solution.Being stimulated to think about how this integrates with today's popular BPMS applications is worth the price of this book. I recommend caution, however.This book will help you with cases that involve modest amounts of knowledge.It will not, however, prepare you to tackle the really hard or complex problems that would require thousands of rules.Those problems are still beyond what we can handle in a cost effective manner.You are better to hire a good CEO or a good enterprise architect than to focus on trying to define the processes he or she will use.But for many more modest knowledge-based jobs and processes, the approach recommended by ACM will probably work fine. I strongly recommend this book.Others will come out with different ways of dealing with knowledge-based processes, but this is a very good start and suggests an approach that will certainly be rapidly developed in the year ahead.This book will not prepare you to build an Adaptive Case Management system, but it will certainly give you lots to think about. Like BPM, the Next Generation! As I was reading this book, I realized that I really need this technology badly and my department needs this technology badly. We simply must adopt the concepts presented in this book or as another reviewer alluded to, the consequences could be dire indeed. I predict you'll like it! I enjoy books that help me think about things in new ways and also provide practical advice. "Mastering the Unpredictable" did not disappoint From Keith Swenson's first chapter on the nature of knowledge work, to my colleague Tom Shepherd's discussion of adaptive case management using examples from the insurance industry, to the thoughtful view that John Matthias paints for the courts, I found ideas in each of the chapters that I can apply. Of course, the premise that an ever increasing amount of the work we do is unstructured and unpredictable seems to immediately make sense in today's "information economy." And, finding better ways to get things done given the economic turmoil we currently face is appealing whether you are a technologist or a business leader. I recently shared copies of the book at a Supply Chain Leaders conference I participate in each year and the feedback was very positive - this subject definitely resonates as they focus on managing exceptions and risk. The MtU authors all bring intelligence and a strong experience set to their contributions. Further, as Nathaniel Palmer points out in his Introduction, the contributing authors - including Forrester's Connie Moore who wrote the Foreword - are all passionate about this subject.That combination makes for a good read. Knowledge management promises concepts and instruments that help organizations support knowledge creation, sharing and application. This book offers a comprehensive account of the many facets, concepts and theories that have influenced knowledge management and integrates them into a framework consisting of strategy, organization, systems and economics guiding the design of successful initiatives. The third edition extends coverage of the two pillars of implementing knowledge management initiatives, organization and systems. this book was in great condition an a great price...seller was speedy with delivery....thank you very much!!! 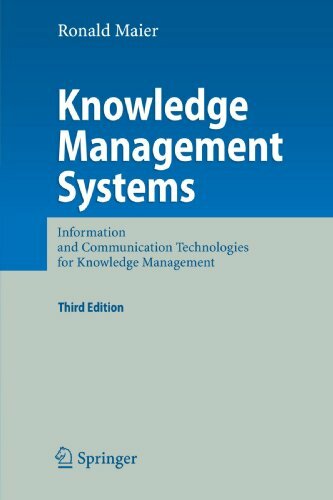 Review of Knowledge Management 2nd Ed. I really dislike this book (2nd ed paperback). The book could have communicated the theories and concepts so much better than it actually did in this second edition. The missing pieces are many. To introduce a concept so incredibly thick with information should be illustrated better, use examples of companies which currently implement the topics discussed in the book, and use the technology discussed to create more visually appealing figures and boxes. These figures and boxes are a secondary method of learning and reinforce the text. If the illustrations are bad, and the explanation is not great, you have just lost your reader. Learners need to relate the information to real live experiences or to known companies if the information is to be absorbed appropriately. I did not read many well-known companies identified in this text. The information is flat which creates a very boring book to read - a book that contains a tremendous amount of information that is difficult to digest. Moreover, I found the book very frustrating to read. I threw it down a couple times but then picked it back up and tried again to understand the concepts. Aside from the grammatical and punctuation errors, the authors repeat themselves on occassion and use way to many bulletted lists when making their point. I don't want to read a bunch of bulleted lists. This book reminds me of a rough draft that somehow made it into print without going through review. I gave this book only one star because of the attempt made to disseminate the informaiton. I think the authors could do a whole lot better if they worked with a creative team to capture a more innovative way to capture and sustain the reader's attention. The book needs to be re-vamped by a publisher/editor who can add reader interest into the topics. If you are an insomniac, this book's for you. For professors considering using this book in the future, kindly think again. Find another book with does not let your students down. My coauthor and I read belatedly a 2006 review of our Knowledge Management (copyright 2003) by a student and found it "absolutely reckless".The reviewer in question is accusing the author that "we do not know what we are writing about", picking on specifics such as "how to dress" for a knowledge capture interview.We have designed and implemented several knowledge base applications for respectable firms and were complimented about how well we came across (in dress and approach) when we were interviewing senior management.Clients have expectations and only a fool will ignore looks, demeanor, and attitude. We thought including one paragraph about dress code in a 500-page book could add practical value to concepts and procedures in a textbook. Unfortunately we used this book for a graduate-level Knowledge Management class.In my opinion, there was little information that could be applied in the real world.I'd venture to say that nobody with actual IT application management or development experience was involved in the writing of the book. I have to say that I'm not quite done reading the book, but I have skimmed through the entire thing and have read several chapters.I would like to see more mentioned on security aspects of KM, but so far, not so bad. I don't usually consider this in a book review, but I am disappointed with the physical quality of the book itself.It seems like the authors submitted a color document and took it to the cheapest publisher and had the darn thing photo copied.There are a number of illustrations that simply can't be read.The quality is terrible.This also goes for the labeling of figures, tables, etc....On one page, I can read that it says Figure X.X but can't really see the text next to it.It is seriously detracting from the book.